Maisha bent down to look inside Misty Horn’s giant egg. Like the sugary Easter eggs, it too had a little peekaboo window. Inside was a miniature picture of a marsh, a bay, and fountain-shaped spouts she recognized as whales. There were scores of whale blows in the air. There were seals, lounging on rocks. There was a bear, clutching a large fish. Maisha couldn’t tell what the creatures were made of, but it certainly did not look like sugar. Along the inside of the egg were horizons dotted with green hills and tall trees. At first, it looked like a picture. Then, something stirred in the colors, shapes, and lines as if the picture were really alive. Richmond Tales, Lost Secrets of the Iron Triangle has been selected by the California Teachers Association for the 2015 READ ACROSS AMERICA campaign. Selected as Richmond's first All City-All Read book. 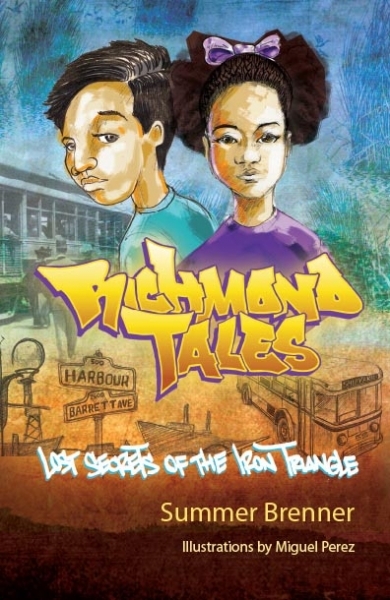 Read the news article online about Richmond Tales, Lost Secrets of the Iron Triangle at the June 2011 Family Literacy Festival! Therefore, I Gayle McLaughlin on behalf of the Richmond City Council, proclaim Saturday, June 5, 2010 is Family Literacy Day in the City of Richmond and we encourage all children and families to attend the Richmond Tales Family Literacy Festival on this date from 11:00am – 3:00pm at 217 South 11th Street to receive a free copy of Richmond Tales, Lost Secrets of the Iron Triangle and to join the city-wide family book club.